There are a few components to a tracking system. 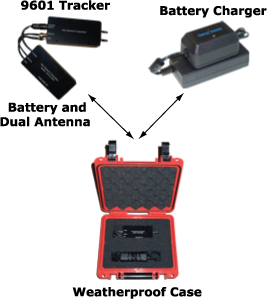 The mobile tracking device is connected to both a battery and a 2-in-1 antenna (GPS & Iridium). The unit is inside a protective case suitable for harsh climates and is impact, UV, and chemical resistant.